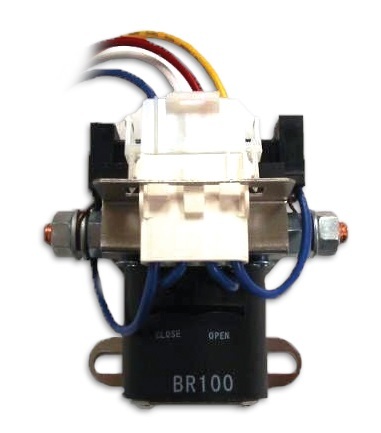 The BR100 is a solenoid type of high current relay that is typically used to isolate either house or engine batteries from the electrical system that they are connected to. This is done to prevent complete battery discharge in long storage periods or other times when charging batteries may not be possible or desirable. The BR100 can also be used to isolate batteries in banks to aid in charging or keeping reserve power. The BR100 is designed for nominal 12VDC applications. Peak Current Rating: 300ADC @ 12VDC for 30 seconds, once every 5 minutes. Auxiliary 10ADC circuits are available on each side of switch for convenient wiring of additional loads. Single Pole, Double Throw momentary, or fixed 12VDC .250 Amp minimum switch (not included) is required for complete installation.